The later poetry of Edward Estlin Cummings is instinctively recognizable to any lover of poetry. His page is a visual canvas, upon which words are not simply sounds that peal back to produce meaning, but aesthetic objects laid out upon the page. E.E. Cummings was born and raised in Cambridge, Massachusetts, at 104 Irving Street, just a stone’s throw from Annenberg Hall – where Harvard’s freshman now dine. He was the son of a Harvard Professor – Edward Cummings – who had been one of the first Professors of Harvard’s burgeoning Sociology Department. Born and raised within the echoes of student’s footsteps as they rushed to class, Cummings would enter its gates as a freshman in September 1911, although he would continue to live at home until his Senior Year. During his time at Harvard, Cummings was known for his tastes in avant-garde music and literature, and for being a member of The Harvard Advocate and a founding editor of another literary publication, the Harvard Monthly. Having written poetry every day from an early age, a number of Cummings’ poems written during his time at Harvard were published in The Harvard Advocate. 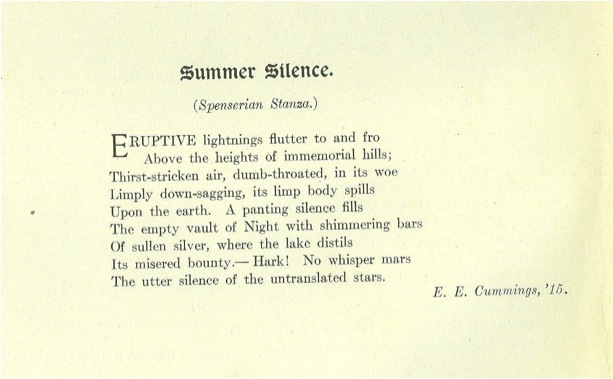 The poems “Summer Silence” and “Sunset” were both published in different editions of The Harvard Advocate in March 1913 – when Cummings would have been a Sophomore. The first of the two, “Summer Silence,” is written in Spenserian Stanza – a fixed verse form created by Edmund Spenser for his epic poem The Faerie Queen. The Spenserian Stanza is composed of nine lines, eight of which are in iambic pentameter, and the last of which is in iambic hexameter. (A structure to which the poem does conform, with the exception of the sixth line, “The empty vault of Night with shimmering bars,” which adds a final unstressed syllable to the end of the line, a departure from the five feet line known as a feminine ending.) 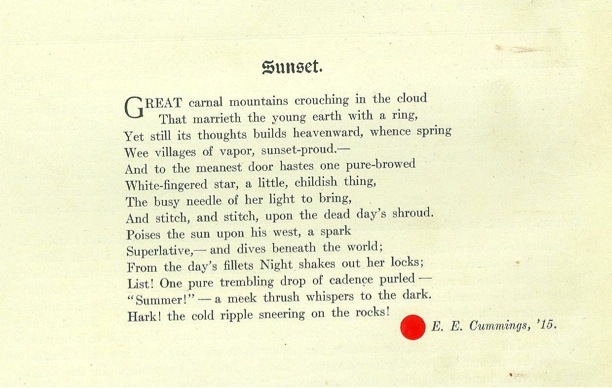 The second of the pair, “Sunset,” is written as a sonnet and, in this manner, both poems register a sharp comparison to Cummings’ later, structurally experimental poetry. In “Summer Silence,” the air sags down near to the earth, but in a manner that is uncomfortable, stagnant. In the lines above from “spring!may-”, just as in “Summer Silence,” the earth and the sky merge, coalesce; yet in this later poem, Cummings’ language is direct and unadorned (a mark of his later verse); whilst the image of the sky and earth merging is something positive, and reinforcing. But perhaps a comparison of Cummings’ earlier poetry published here in The Harvard Advocate to his later, matured style is not necessary or constructive. For, regardless of what Cummings will produce later, the imagery utilized in “Sunset” is intrinsically visceral, and successfully makes concrete the grandeur of a fleeting impression. He uses a metaphor for sunset as the light stitching up the “shroud” of the dead day– this move is powerful, and although somber, poetic. Moreover, the poem talks about “day’s fillets” from which “Night shakes out her locks,” where the use of the word “fillets” suggests surgical amputation. The poem is dark and almost terrifying in its depiction of a sunset. Yet it is in this ability to excite mood and emotion, often in a manner that leaves one confused as to how this emotion has arisen, where Cummings’ talent lies.